That’s right. Web design is constantly being optimized and aided by secondary applications, including browser extensions, which makes the whole design process smoother. Let’s see what the Chrome developers have prepared for the web design community. Curious what fonts have been used on a given web page? Long gone are the days when you had to dig into the code of a website or use secondary tools such as Webkit or Firebug to identify which fonts have been used. What Font gives you a swift and elegant solution to this problem and offers you the opportunity to look up a font within one single click of a mouse. It’s light and won’t overload your computer while activated so it’s a great browser extension for slow machines as well. Get this Chrome extension here. Your real-time guide to the Web’s freshest design content. Just install it on your browser and enjoy having all of the Internet’s greatest art curation galleries at your fingertips. 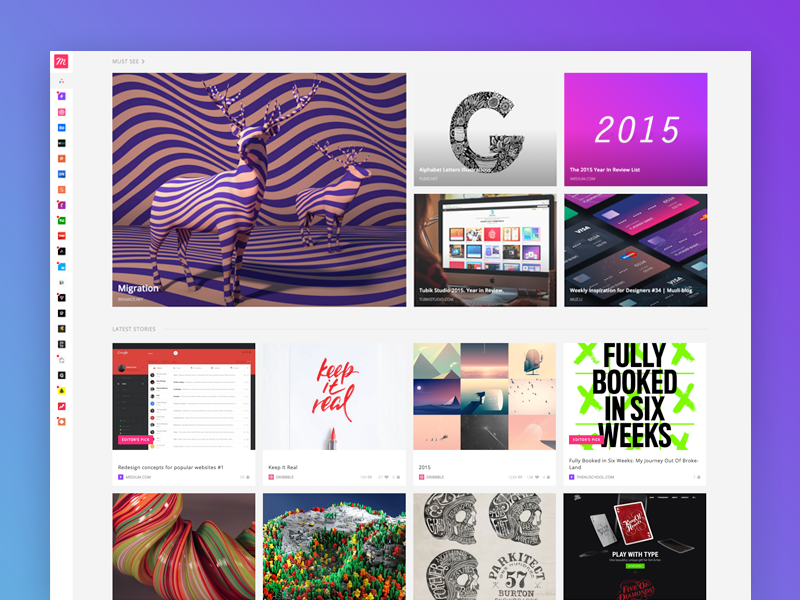 Muzli newest version has a sleek side menu that features a long list of design websites to choose from. The grid-based home page provides a comfortable solution for quick browsing, but that’s hardly the best part of this extension. Muzli will amuse you with a stunning collection of handpicked content featuring news, photos, and resources that will make your daily browsing experience an absolute joy. Muzli can be a refreshing addition to your morning coffee break and will power you up with inspiration from all around the world. Curious to learn how your newly designed web page responses to different devices? Put your browser in edit mode with this handy Chrome extension. Design mode allows users to edit live web pages and works the same way as an HTML editor. This clever tool is extremely helpful for website layout testing. It allows users to edit text, change fonts and drag images across the web page. It is extremely handy for checking whether or not certain design elements will break when the text get too long or a photo is too large. See how your web layout will react to different edits to be able to better optimize your design. Being able to download images in a bulk can be really useful when you’re a designer. When you’re hunting for free photo resources, you’re gathering images for inspiration or you want to just make a quick backup of the images on a certain web page, Image Download will be your helping hand. This Chrome extension will allow you to filter images by height, width and URL. It also supports Regex and Wildcard. You can select images for downloading by simply clicking on them and it also allows you to hide notifications, filters, and buttons that impede your browsing experience. Friendly note: Make sure you’re not violating any copyrights before downloading images to your personal device. If you plan on using images for commercial purposes you need to check the license agreement on the site, if there is any, or simply ask the images owner for a permission. Rule the web design world with this handy Chrome extension. Page Ruler is the designer’s best friend when it comes to measuring elements on a web page. This tool will allow you to draw a ruler on any given web page and view the main size measurements. It displays width and height, and gives you the positions of the left, right, top and bottom side of your selected area. Want even more design tools?